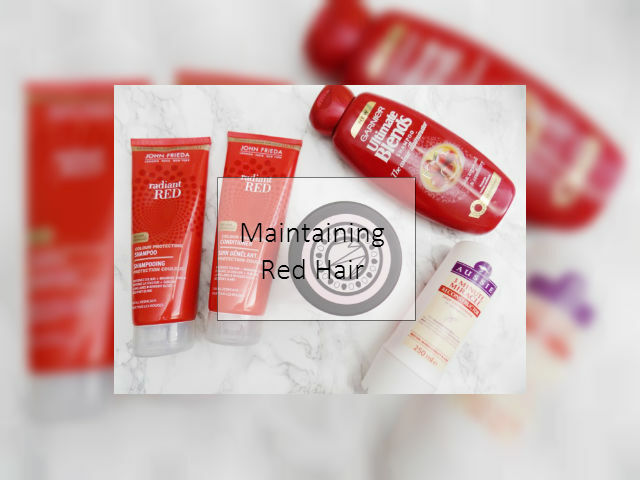 I love having red hair, especially in the Autumn and Winter, so I thought I would tell you all about my hair, the dye I use, how I maintain the red, products I use. I have recently had the chop. I cut off about 8 inches, which made me very very sad but my hair feels so much better for it and I have been getting super fed up of my hair being so long and looking scraggly. But enough of that, if you want to know more about my new style then check out the post I did about it here, and if you want to know the products I use to style my hair, add texture and volume etc then click here. But onto what I use to maintain my red hair and my other hair care products. Anyone who has ever dyed their hair red, knows that it is an absolute nightmare to maintain the vibrant colour and whenever you wash your hair, red still comes out even after a month. The hair dye I used this time was the Garnier Olia Permanent Dye in Dark Garnet, which is as far as I know a new shade that came out with Bright Garnet. So to protect my hair I like to use colour protecting Shampoos and conditioners and I have two that I alternate between. 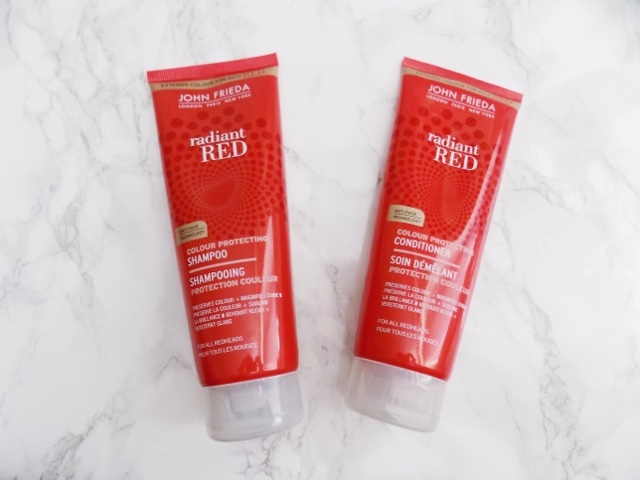 First is the John Freida Radiant Red Shampoo and Conditioner, these are, as the name suggests, specifically for red hair. These are supposed to revive colour and magnify shine, Although it is a red shade, the actual products don't add colour to my hair, which I like because I find those kinds of products leave a red cast so whenever I touch my hair my hand turns red, and I cannot deal with that as I always run my hands through my hair. 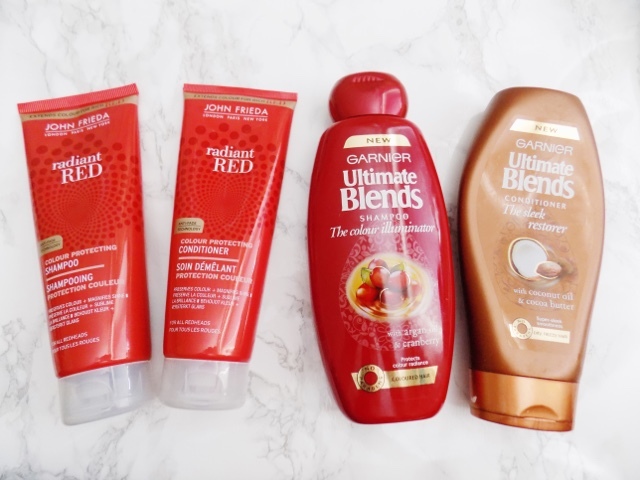 I don't like to use just the John Freida products, I like to rotate them with these which are from the Garnier Ultimate Blends, first is The Colour Illuminating Shampoo and then the The Sleek Restorer Conditioner. 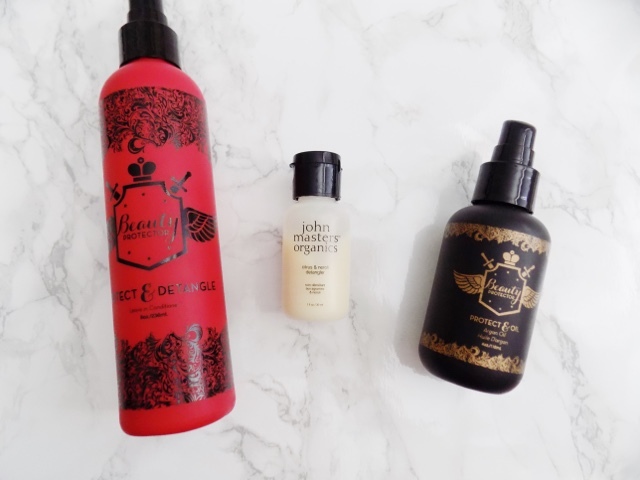 So although the shampoo is still a colour protecting one, I find it really gets rid of any product build up in my hair too which is why I rotate between the two shampoos, but it's also very nourishing as it has Argan Oil in which the JF one doesn't. As for the conditioner, this is super hydrating as it has coconut oil and cocoa butter so it's super hydrating and nourishing and smooths my hair and gets any frizz under control. To add some extra hydrating and moisture to my hair, I like to go in with a hair mask once a week. I have two that I alternate between, one is fairly new which you're probably sick of seeing on my blog now and that is the Maria Nila Stockholm Luminous Colour Masque. This is another colour protecting product but it also nourishes my hair and makes it feel so soft and smooth. This really is an incredible mask, and I highly recommend checking it out. 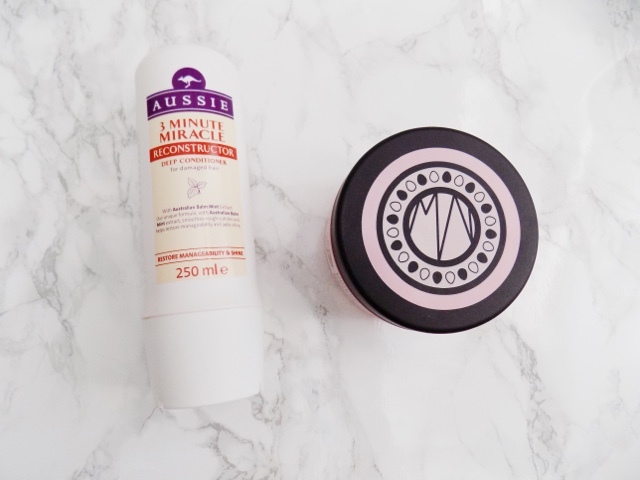 The other mask is the Aussie 3 Minute Miracle Reconstructor Deep Conditioner for Damaged Hair, which is available at the drugstore and in supermarkets and it is an incredible deep conditioning treatment. It makes my hair feel soft and smooth but I can't use it too often otherwise my hair just feels greasy and weighed down but it is still an awesome hair mask and I love it. Just remember, you can also use Coconut oil as a hair mask which I do on occasion and it does wondrous things to your hair. Trust me, you should try it. Okay now we're on to the hair care products. My hair gets incredibly tangled when I wash it, so I have to use a detangler and I have two favourites, first is the Beauty Protector Protect & Detangle Leave In, this does a lot of other things as well (which you can see here in my review) as detangling and the products from this brand smell so incredibly delish. I have also recently started using the John Masters Organics Neroli & Citrus Detangler which is a cream as opposed to a spray and this is truly magic in a bottle, this detangles my hair in seconds and as soon as I finish this sample size that I received in a beauty box last month, I will for sure be picking up the full size and maybe try another scent too. 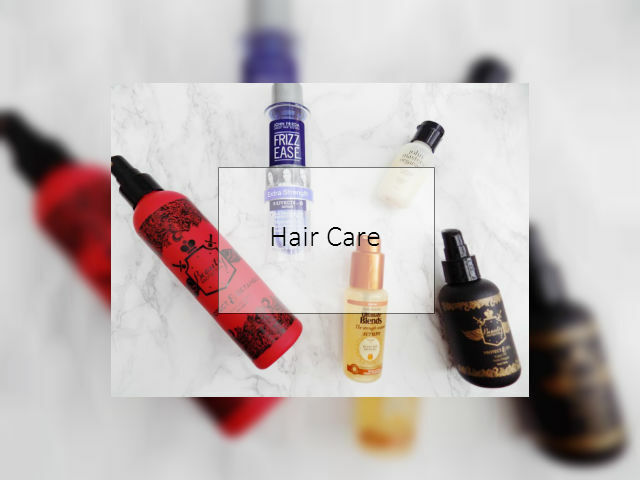 I also wanted to show you the hair oil that I use which is my favourite. It's again from Beauty Protector and it's their protect & Oil Argan Oil, again, the scent is just incredible and the oil itself makes my hair feel so incredibly soft and nourished and this has a massive part to play in repairing any damage that heat and hair dye and all of that does to my hair. I also like to use this oil after I've styled my hair to add an extra shine and to make it look sleeker and smoother with no fly aways or frizz. It works great. Serums are a great way to really treat your hair and these two are great drugstore options. 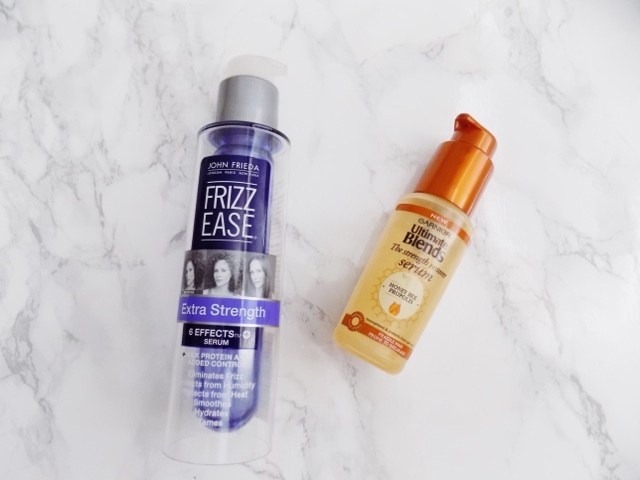 The John Frieda Frizz-Ease Extra Strength 6 Effects+ Serum is something I've used for a while and the idea is you apply onto damp hair and it eliminates frizz, protects from humidity and heat and it smooths, hydrates and tames. It's a great product and I can always tell a difference in my hair when I don't use this as it's not as smooth and sleek and there's just more frizz and fly-aways. Plus it's only £5.89. 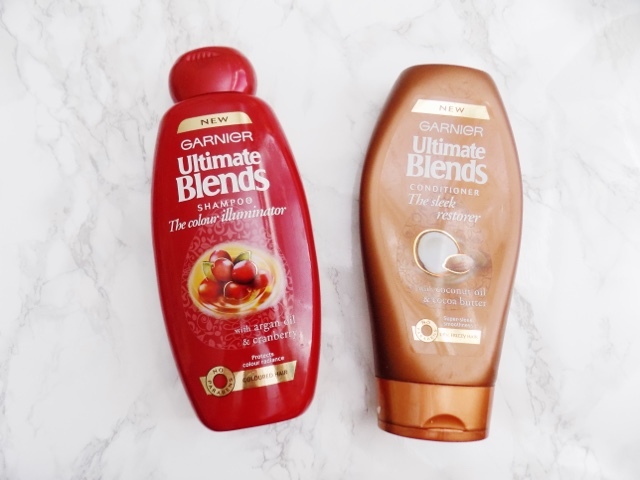 I've also been using the Garnier Ultimate Blends The Strength Restorer Serum which is to help damaged and fragile hair that's prone to breakage and it reduces split ends too which when I had long hair was a massive problem and now I've cut my hair I am still using this to hopefully be able to prevent split ends. This one can be used on both wet and dry hair and even helps with breakage due to brushing your hair which is a massive issue with many people who have long hair and especially if it's damaged. It's £4.99 from the drugstore so won't break the bank. Drugstore hair products are great, really perform well and I don't think you need to spend lot's of money on hair care. 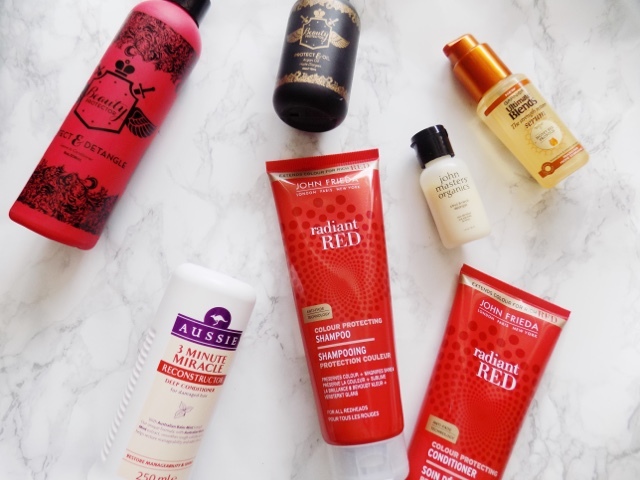 What's your hair care essentials?